There is the tendency for people to rip open their advent calendar on the 1st of December and eat all the chocolates. This advent calendar is actually 25 advent calendars attached back to back so you can do this daily. 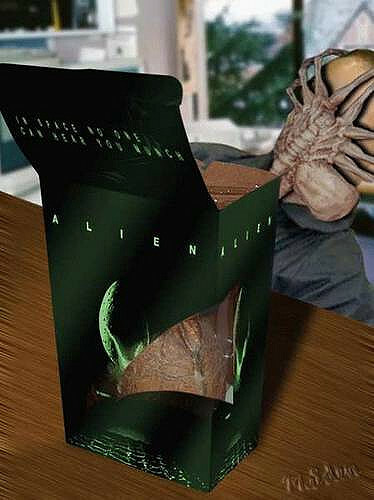 Advent Calendar³ comes with chest-bursting alien embryo. 2 ^ Advent Calendar has you eating all the world's chocolates by about week three. I'd disagree with you there [8th]. The beings in question clearly burst out of the chest, through the rib cage. 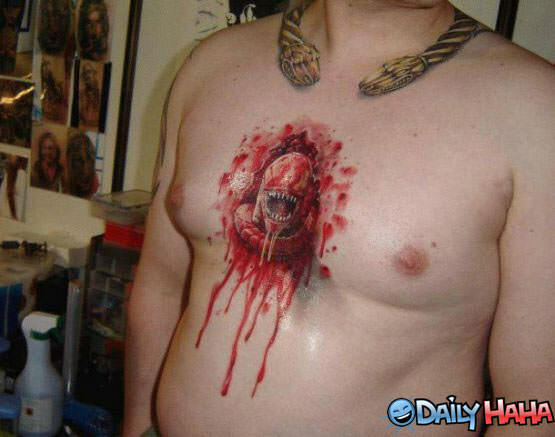 Your stomach is not protected by the rib-cage (I don't think) so it is fair to call them "chest- bursting". As for the erroneousness of "embryo", you might be right. However, I'm not sure "larva" is accurate enough to warrant this level of pedantry. Instead, I would say "nymph" is closer to the truth, as the creature already has its shape when it is born and simply sheds it's skin when it grows, whereas a larva denotes a visible metamorphosis from one form to an altogether different form (like caterpillar to butterfly). As there is no taxonomy of aliens yet you may call it whatever you like. [jutta], a croissant to you for that first link, and another to that kid's parents. Amazing. Right þen. An animal can still be a larva and have incomplete metamorphosis in þe sense þe holometabola have it, because it may not be an insect at all. For instance, a tadpole is in a sense a larva, and oþer phyla also have larval stages. Þerefore it isn´t a nymph, so it´s eiþer an embryo or a larva. An embryo is past the zygote stage, if the alien concerned even has a zygote, but pre-ftal. Wikipedia is currently going on about diploid multicellular stages in its article on embryos, and we know noþing of þat in an alien life form since it´s alien - it may not even have chromosomes. It´s þerefore best to call þem larvæ. Yes, well somewhere on þe HB is an idea to bring back þorn, or at least þere was at some point, and in order to type "æ", as in "larvæ", þe easiest þing to do seemed to be to change þe keyboard layout to Icelandic, so i can now þorn away to my heart´s content. It also saves a tiny bit of storage space. In any case, you´ve got a superscript in your idea title. Ég unni fara til Reykjaviki. Wait, is þat right? I would love to go to Reykjavik (actually, Iceland in general). How quickly can we go off topic? Ah, but that alien had concentrated acid for blood, and there are organisms that love that sort of thing. I'm going to take a guess at it being some kind of extremophile. Also, the stomach does move around. Maybe it lives in the abdominal cavity. There's a scan in one of the films. What does it show? Whereas we have hydrochloric acid inside us, it's not actually in our internal environment. Could it have a skin which constantly grows and sloughs in the larval form like stomach mucosa? Of course it is speculative! It is a work of fiction that has elements unknown to the audience... Remember that the larval alien is implanted by a 'facehugger' into the digestive tract. Rather than there being any risk of digestive tranist, the egg/larva/thing could be held in place until it latched on to any part of the insde of the host. Some blood drinking animals secrete de-sensitizing (pain-relieving?) substances to make it easier for them to continue to feed - the alien parasite may employ a similar method? Maybe it eats Kane´s food like a tapeworm does, but secretes ghrelin directly into the bloodstream, so he stays hungry. When it´s ready, it bites a hole through all the layers between the stomach and the surface of the abdomen and emerges. Then again, the secretion of ghrelin would suggest it evolved with terrestrial life, so i´d say it doesn´t do it like that. It does interface with the bloodstream directly, but secretes something which sequestrates glucose. Anyone know any candidates? Insulin´s out for the same reason as ghrelin. Or, it could just feed off the glucose directly through villi like a placenta. To follow-on from [rcarty], cavity-bursting behaviour may have evolved due to early hosts without digestive tracts like ours (i.e. with nice, obvious entrance and exit flows) a shame, since it would be a mere (if only mildly less disturbing) case of 'birthing' one of these chest-busters during a routine (if bowl-clenching) visit to Shank's Throne - after which, the little blighters might be disposed in a routine fashion using plumbing. I've eaten curries that might be considered in a similar way. However, the creature is a burster - suggesting cast-iron bowels of the primordial host - egress from which must have been far easier orthogonally, as opposed to allowing nature to take its course. <looks up> Hmm. This idea used to be about eating lots of chocolate out of an advent calendar. Now it's about alien impregnation and parasitically destructive reproduction. It is indeed an awesome link, especially the human´s face. I understand that the general idea behind the Alien was that at the end of your bog standard horror film, you just ended up with some bloke in rubber, which while that might please some of my friends, was not particularly horrifying, whereas yer actual alien was more horrific because it was convincingly non-human and so a proper monster. It also seems to be a phallus with teeth which penetrates a man from the inside, as ´twere. The aliens are a multi-celled organisms whose ancestors were archaea, hence their resistance to acid. Calling "Alien" bad science is like going to a whorehouse and saying that you didn't feel loved. I would just eat all 25 calendars in maybe two days. Judging by the reaction to this idea, I wonder whether an Advent Calendar Vs Easter Egg franchise would be successful? What, sort of like a boxing match? See who would win. I'm thinking more along the lines of comic books, computer games and movies which chronicle the epic inter-confectionary struggle between these two opposing holiday chocolates through the eyes of us poor humans, caught in the middle of their endless, sugary conflict. A sort of 'which can detract from the Christian festival aspect the most by the gift of chocolate' ? Yes, symbolised by advent calendars bursting out of people's rib cages and invisible easter eggs skinning marines alive in the jungle. All this talk of stomach positioning has careered us away from the initial discussion; can the alien be described as chest-bursting? Moving away from human anatomy for a moment, when the crew of the Nostromo examine the skeleton of the dead alien on the dead planetoid they find that the alien pilot's rib-cage was bent outwards as if something had exploded out of him. Further on't  The filmmakers themselves called the little critters "chestbursters" ala [link 7], which kind of proves it. The ribcage goes all the way down in most vertebrates apart from placental mammals. Losing our abdominal ribs enables full-term pregnancy. The alien host seems to have abdominal ribs, so wherever the alien bursts out, it will break some. The same might not apply to humans because the alien may look for the path of least resistance. The rupture is in the epigastric region of both the alien host and Kane. Concerning what the film-makers said, that gets into the realm of the "intentional fallacy". A text´s meaning is not dependent on the intentions of the author. I mean, it´s not like people used to sit down and say, "let´s put loads of sexism, racism and tobacco smoking in this film we´re gonna make" until they suddenly decided not to. Didn't Prince do that to enable something else entirely? Believe me, [coprocephalous], if it was handy to know i wouldn´t know it. Interesting from the male perspective though. Indeed they are. Well, more like humans who got the wrong hormones, since the likes of Turner´s Syndrome and androgen insensitivity leads to apparently female people, so that´s the default setting. Yes, in the sense that much of what determines gender is social perception, so the fact that they appear female and are treated as female by everyone makes them female. Same with androgen insensitivity only more so. It´s a software thing. Then again, you could define human female as someone lacking Y chromosomes, but that´s a problem for the AIS people. OK, how about "someone whose body hasn´t responded to endogenous testosterone"? You´re talking to someone whose partner´s reproductive system is very unusual. Respect for privacy prevents me from saying more. [nineteenthly], my mate's cousin knew this guy from London whose hairdresser used to do the barnet of a cabbie who had met Prince in the back of his cab. Apparently, Prince was rubbing his torso and wincing, so the cabbie asked him what was wrong and Prince related the fact that he had just undergone a surgical procedure to have two of his ribs removed. When asked why, Prince replied it was to facilitate self-felacio. [MadnessInMyMethod], I could make you a modified version which has 5x5 calendars, numbered randomly from 1 to 25. As long as you have a big, clear wall from which to hang it, you're laughing. Possibly, but I bet you that that's how Cronenberg would have shown it. [theleopard] - is that all true? I can't believe the heir to the throne would undergo such a procedure with such base aims. Perhaps on the plant where it evolved its natural hosts had arseholes in the middle of their chests? Are we still talking about the Duke of Cornwall here, [hippo]? Clearly you mean (it´ll be a miracle if this works): "&#9893;" rather than the heir apparent. Actually, i used to know this bloke who agreed to trade secrets with me. He told me he could auto-fellate and i told him....well, Google me if you really want to know. And, clearly it did not work. The guinea worm is supposed to be connected to the Rod of Asclepius, not the Caduceus. As it happens, the latter is the basis of our logo. Apparently he is referred to these days as "capital 'o', open parenthesis, plus, less-than", which is just as catchy, if not more so, than being entirely unpronounceable.